UMBC has provided countless opportunities for me to travel, learn, collaborate, and develop my craft. Sam Winnie is a trombonist, bass player, and composer—a multi-talented musician who has collaborated with dancers, filmmakers, and game developers. His work has been recognized by fellow musicians in his field. Most recently, the jury of the National Student Electronic Music Event accepted a piece of his for performance at the University of Oklahoma. Winnie is Linehan Artist Scholar, recipient of the UMBC Achievement Award, and member of Phi Kappa Phi Honors Society and the National Society of Collegiate Scholars. For his study abroad experience he attended the Conservatorio G. Nicolini in Piacenza, Italy. Since then he has worked in UMBC’s Study Abroad office, assisting other students in developing their plans for enriching study abroad experiences. Winnie will return to Europe for graduate studies in music composition at the Hogeschool voor de Kunsten Utrecht in the Netherlands this fall. 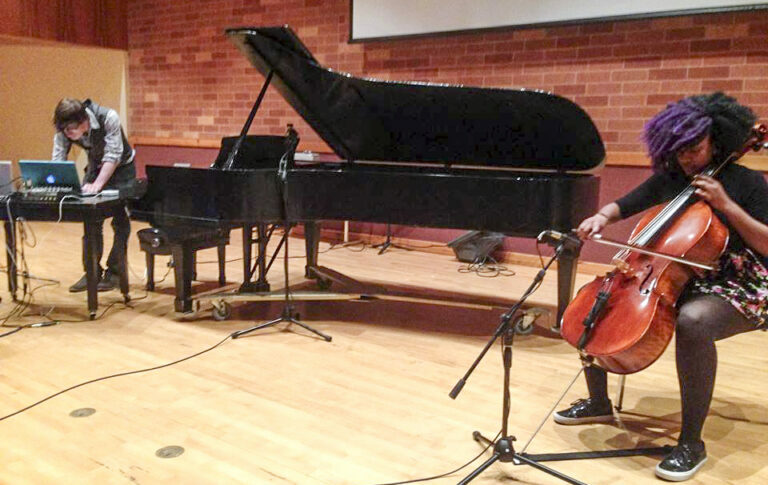 Images: Sam Winnie and cellist Chanel Whitehead at the University of Oklahoma, performing a work for solo cello and live electronics for the National Student Electronic Music Event; photo courtesy Sam Winnie. Portrait by Marlayna Demond ’11 for UMBC.